I don't have any witty analysis. I just want to make sure that people hear about this creepy, underhanded Totalitarian tactic that thankfully failed. Opportunity Knocking . . . Elsewhere? BURLINGTON — Is the City of Burlington thinking big enough about its telecommunications business? Not according to the longtime and soon-to-be-former head of Burlington Telecom. BT General Manager Tim Nulty handed Mayor Bob Kiss his resignation Monday morning, opting to accept a job with ValleyNet. That White River Junction-based nonprofit communications group is dedicated to providing community-based information resources similar to the fiber-optic infrastructure BT provides. Nulty says he is accepting a “significant” cut in pay to go to ValleyNet. His last day on the job at BT is November 21. Based on BT’s initial success — 2200 subscribers, a $2.7 million annual revenue and rapid growth rate — Nulty says BT is poised to expand into, and earn revenue from, other communities. But he’s encountered resistance from Mayor Kiss, he says, citing “nervousness” and “political pushback.” Kiss decided earlier this month to hold off on BT’s growth outside Burlington. Nulty doesn’t want to wait around and let the opportunity pass. The municipally owned network is “the first, it’s the best, it’s the biggest, but it’s not the only game in town,” he warns. For his part, Nulty is sure “other flowers are going to bloom” soon, as he puts it, and even more sure he’s going to be there to smell the roses, whether the City of Burlington gets a whiff or not. Yikes! This post doesn't have much to do with the 802, but if you support governmental transparency and the freedom of the press, I think you'll find it interesting. Below is a press release from the Association of Alternative Newsweeklies, our trade association. Apparently one of our members, the Phoenix New Times , pissed off a county sheriff a few years back. In the course of an investigation into some suspicious real estate deals, they put his home address on their website. The sheriff's home address is available elsewhere online, but he convinced a political ally to investigate the paper anyway, and last week, the Phoenix New Times founders were arrested. A bunch of AAN members — including Seven Days — are showing solidarity with the Phoenix New Times by linking to all of these places where you can find this guy's home address online. Member papers of the Association of Alternative Newsweeklies (AAN) this week are providing links on their websites that direct their readers to the many places on the internet where the home address of Maricopa County Sheriff Joe Arpaio is listed. AAN papers are doing so to show solidarity with the Phoenix New Times, which was threatened with felony prosecution for publishing Sheriff Arpaio's address on its website in 2004. After an adjoining jurisdiction declined to press charges, Arpaio's political ally, Maricopa County Attorney Andrew Thomas, convened a grand jury to "investigate" charges the paper broke the law when it published Sheriff Arpaio's address. Last week, Phoenix New Times' founders Michael Lacey and Jim Larkin were arrested and jailed after the paper published a story about the grand jury and subpoenas they had received that demanded detailed internet records of any person who had visited the newspaper's website since 2004, as well as all notes and records from any reporter who had written about the sheriff in the preceding three years. After Larkin and Lacey were arrested an outpouring of shock and anger accompanied widespread media coverage of the case. The response created a groundswell of support for New Times. The charges were dropped less than 24 hours later after Thomas admitted that his office had made "serious missteps" in the case. "The actions of Mr. Thomas and Sheriff Arpaio in this case are beyond outrageous," said AAN executive director Richard Karpel. "They abused their offices by engaging in Gestapo-like tactics designed to silence a newspaper that has been highly critical of them in the past." Added AAN First Amendment Chair Tim Redmond, executive editor of the San Francisco Bay Guardian: "Our association and its members won't tolerate this sort of attack on the right of a member paper to publish information that is and ought to be public record." "This was a victory for the First Amendment, the constitution and for our readers right to read our newspaper without the government spying upon them," said Larkin and Lacey in a joint statement. "As the federal press shield legislation moves from the House to the Senate, we hope people will remember what happened to reporters, editors and readers in Phoenix." Phoenix New Times has published dozens of stories critical of both Thomas and Arpaio. In fact, the paper maintains an archive on its website of its coverage of Arpaio since he was elected sheriff in 1992. New Times published Arpaio's home address in a story arguing that he abused a state law that allows law enforcement officials to keep their addresses from being made public. New Times said Arpaio used the law to hide nearly $1 million in cash real-estate transactions. Arpaio continues to resist New Times' request for information relating to his real estate holdings. 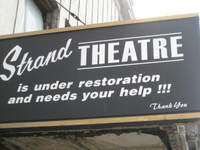 It's been a few weeks since Mike Ives and I made this audio slideshow about the Strand Theatre in Plattsburgh, NY. I was just looking at Google Analytics, and I noticed that not nearly enough people have watched this slideshow, given the effort that we put into it. It's pretty cool, actually. An arts organization is restoring this old theater in downtown Plattsburgh. Check it out. I was away in Chicago for a wedding on Saturday, and when I got back, I had an email in my inbox from Burlington Telecom director Tim Nulty. I wrote an extensive story about Nulty a couple years ago, back when BT was getting off the ground. I was surprised to hear that he's leaving. I am hereby tendering my resignation as General Manager of Burlington Telecom. To ensure a smooth transition, the effective date will be 30 days hence, or November 21, 2007.
a) BT is now a strong, mature institution which is financially, technically and operationally capable of completing its mission with respect to the City of Burlington. It is, as you know, cash-flow positive for operations (a major milestone for high-tech start-ups) with over 2200 subscribers and approximately $2.7 mln in annual revenue. Further, it is adding between 40 – 50 subscribers and over $50,000 of annual revenue each week. By the beginning of 2008 the main network “build-out” will be complete with approximately 93% of Burlington homes passed and plans in motion for the remaining “bits and pieces”. In short, BT is firmly on track to reach its goal of universal service and overall positive cash flow (i.e. “profitability”) by the end of 2008. While no road is entirely smooth in so dynamic a business as BT’s, I see no roadblocks or potholes ahead that the existing professional team cannot handle in stride. Thus, for this final push to the finish line, my contribution is not essential. The existing team is fully capable of completing the final lap successfully without me—provided they are allowed to do the job unimpeded and without interference. Given these facts, I feel I can leave BT with pride in a job well done and a clear conscience that I am leaving an institution fully able to look after itself. b) The BT project has demonstrated the viability and desirability of publicly owned, universal, open-access fiber-to-the-premise telecommunications networks. Such networks are the “electronic public roads” of the future and proving their feasibility is a major contribution to our society. Having established this important principle, I would like to spend the remainder of my working life building other such networks elsewhere in Vermont where they are needed. c) I have concluded that Burlington Telecom, as a pure City Department, is not an optimal platform from which to do this. This is not a criticism—merely a statement of fact. City Departments are ill suited to provide complex, entrepreneurial services to other towns many miles away. That is simply not what they are created, structured or empowered to do. In conclusion, I wish to say how much I have enjoyed working on this project. I certainly never imagined when I “retired” to Vermont in 2001 that such a move would initiate one of the most satisfying and rewarding periods in a long working life which has had many rewarding and satisfying periods!! I am very proud of the network, the institution and the team that we have built and I believe that it will be a major positive factor in the economic and cultural life of Burlington for (at least) the entire century to come. I'm a long-time fan of Bolton resident Alison Bechdel's comic strip Dykes to Watch Out For, (I'm also Alison's former assistant). I read her blog regularly, and just came across this clever quiz. Which Dyke are you? You are Clarice, a driven, liberal, workaholic lawyer. The Bush Administration has caused you a lot of anxiety lately. You have orders to cut one volunteer commitment and spend more time playing GTA3 with your son Raffi.